There is no golf tournament in the world filled with more heartbreak and drama than the PGA Tour Final Qualifying. While most PGA Tour events subject a player to increasing pressure for 72 holes, the final gateway to the richest circuit in golf wrenches it up by another 36. Even those who would seemingly be immune, for example a player like Brad Fritsch already in possession of a 2013 PGA Tour Card via the Web.com Tour, cannot escape the demons that this test heaps upon you. While it may have felt like he was playing with house money this week in La Quinta, California, showing in his 22 under par score through the opening five and a half rounds, Q-School, the place “where nightmares and dreams come true” showed up to haunt Mr. Fritsch, just a little. Despite the nervous interlude, with thoughts of winning the $50,000 first prize and gaining access to a couple more big events in early 2013 in mind, Fritsch managed to keep two hands on the wheel and get himself into the house with a final round of 68, including a very satisfying birdie on the final hole. He still picked up a cheque for $25,000 for his efforts. After having finished 18th on the Web.com Tour money list this year Brad had just one goal in mind this week, a top 17 or better finish. His 22 under par total did just that, ultimately tying him for 7th place and only leaving him three back of the medalist, Dong-hwan Lee. “We” means Fritsch and caddy Jeff Scott who made for quite a team all year with Scott reading all the putts and Fritsch focusing on holing them. It made for a little extra fun in the 5th round when Brad was partnered with 3-time PGA Tour winner Camilo Villegas. Scott, a former assistant professional at RideauView G&CC in Ottawa, reads putts just as Villegas does, in a crouched “superman” style. It seemed to work out better for Fritsch on the day as his 66 bettered Villegas by 7. 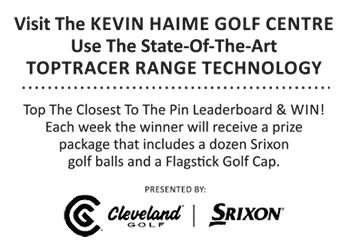 That gear shake-up for Fritsch came in the hybrid department when he utilized a 20 degree model on the Nicklaus Tournament course while he subbed in an 18 degree hybrid on the Stadium Course at PGA West. On the Nicklaus he used the hybrid to play into the par five holes while the stronger utility club was put to use on tee shots on the Stadium Course. The long-hitting Fritsch says he used the 18 degree for about 6 tee shots for each round at the Tournament course. He did make an adjustment and hit a three wood instead of the normal hybrid on the 108th hole, leading the the last of his 29 birdies on the week. For the next couple days Fritsch will enjoy his rookie orientation for the PGA TOUR but does not expect he will be taking much time off between now and the start of his first PGA Tour campaign at the Sony Open in Hawaii that starts January 7th. As a rookie who does not get to play in pro-ams Fritsch will not have a lot of practice time to get to know courses each week on the ’13 PGA Tour so he is visiting a few in advance. He’ll get to San Diego to play Torrey Pines shortly, will work with coach Patrick Kelly back home in North Carolina, and the week prior to Hawaii, will return to California desert to prep for the 6th PGA start of his career. A lot of friends and family back in Canada are likely feeling the same way. While Fritsch made some gains this week at PGA TOUR Final stage qualifying that was not really the case for the other six Canadians in the field. B.C. native Adam Hadwin, who missed his card by a stroke at the Web.com Tour Championship, gave it a valiant run but ended up two strokes off the PGA TOUR mark of -17. He will return to the Web.com Tour for 2013. Another B.C golfer, Roger Sloan, likely got the most out of the tournament. The Merritt golfer and PGA TOUR Canada member shot 66-68 in the closing two rounds to reach a share of 73rd place and full status on the Web.com Tour to start 2013. Earning conditional and limited status on the Web.com Tour for 2013 were Richard Scott (t-114), Ryan Yip (t-118), Matt Hill (t-118), and Mitch Evanecz (t-139).